Flaine has a fantastic snow record when everywhere else is bare - and it keeps it LATE into the season (end-April)! Cosy, top quality apartment sleeping 4, with ski-in ski-out (skis aux pieds) access to Le Grand Massif - Flaine, Les Carroz, Morillon, Samoens + (Altitude 1600-2500m). Our building is recent, tastefully decorated with plenty of stone and wood to fit well into the mountain environment. Our top floor apartment sleeps 4 (2 in double bedroom and 2 on sofa bed in living room). It has a cathedral ceiling, open plan living/dining area with wood burning fireplace, TV, DVD, and a balcony with table and 4 chairs. There is a double bedroom, full bathroom with bath and shower. The kitchen is well equipped (stove, oven, microwave, fridge, dishwasher, raclette machine, utensils, etc.). All sheets/bath and pool towels/bathrobes are included. There is a heated outdoor pool (30 degrees), sauna and hammam, indoor jacuzzi, fitness room in the building. Price also includes covered parking space, heated ski locker room and WIFI. There is a great restaurant on-site serving excellent modern cuisine, and a second lovely restaurant in our "sister building" behind. It also has a Spa/beauty salon, creche, ski shop and cafe, and a good Spar supermarket - all just 2 minutes walk from our door. There are plenty more shops and restaurants in Flaine - all walking distance, or take the free private (for our building) shuttle bus in the evening if you want to go somewhere else and prefer not to walk! General afternoon/evening entertainment activities organised by building management (e.g. snow shoe walks, drinks by the fire pit). Ski equipment rental and ski passes available a 2 minute walk behind us, at our “sister building” and ESF classes also start there. Order bread/croissants at reception for the next morning for a fresh continental breakfast! No pets. No smoking. Private rental. Many activities available in Flaine in winter, such as ice quadbiking, Paragliding, Snow-kiting, Heli flights, Snowmobiling, ice driving, indoor climbing, dog sledding, snowshoeing, cross-country skiing or even just 10-pin bowling or go to the cinema. In summer in Flaine's centre (walking distance) there are lots of activities for kids: a forest adventure park, accro-bungee (trampoline with harness), tennis, archery, bouncy castles, kids clubs, playground, plus for a small deposit: badminton, mini-golf, beach volley, basket ball, petanque, ++. Hi. We skied in Flaine many times before buying our apartment. There are so many slopes, beautiful views, and when we found a ski-in/ski-out apartment, with jacuzzi and pool, we were delighted! As we love eating out, now we have a cool restaurant in our building, and another behind our building (plus Spar shop) - just 2 minutes walk - it’s even better! Two reasons: 1) Flaine’s great snow record, even late into the season, and the fact that you can ski in and out. 2) What better than hopping into the outdoor heated pool or relaxing in the jacuzzi after a great day skiing? Added to that, the apartment is high quality with a lovely open fire, and you can eat in (raclette machine provided if you love cheese) or try one of the great restaurants in our building and our sister building behind. The little supermarket is also only 2 minutes walk away and you can order bread at reception. Ski rental and passes available just behind us. Everything is at your fingertips! This apartment is on the top floor so has a lovely vaulted ceiling, and an open fire. The building has a lovely very warm outdoor pool and jacuzzi, sauna and steam room, plus gym room. Bed linen ready, beds made for your arrival. Washing machines at -1 level. Tumble dryers at -1 level. 1 space included (indoor parking, gated entry). Pool and bath towels provided. Running machine, rowing machine, with wonderful view out onto the valley. All the usual utensils, crockery, machines (coffee machine, kettle, microwave) provided + raclette machine! Table with 4 chairs. Open plan living/dining, with adjoining kitchen area. Books for all ages, in English et en français. Enjoy! 4 chairs and table. Enjoy breakfast and watch the skiers! The occasional chamois. Outdoor area with communal firepit where hot wine and marshmallow evenings are organised by P&V. Many rental places in Flaine, and ski schools. Cross-country ski trails/walking trails. Ice driving! Heated outdoor pool with lovely views - wonderful in summer and winter. Outdoor heating swimming pool, and indoor jacuzzi - both super warm and relaxing! High quality apartment in modern building. Ski-in/ski-out. Well designed and high comfort. Heated outdoor pool plus sauna, hammam and jacuzzi. Restaurant on-site, super restaurant in building behind, plus you can have pizzas, food shopping, etc. delivered. 10 minutes stroll to many more Flaine shops/restaurants and if you're feeling lazy/don't want to take the car, there's a free mini-bus drop off and pickup service in the evenings run by the building - so you can walk one way and be picked up if you like! Laundry facilities (washing machines/dryers) in the basement. Pool table in lobby. This is a really lovely apartment in Flaine Montsoleil just above the main town. It is well equipped with everything you could need for a great stay. The living area is also stocked with books, games and DVDs so there is plenty to amuse yourself if required. The wifi is also excellent. The complex (Terrasses d'Eos) is modern and tasteful. It has a good range of facilities including a free bus in the evenings to take you to and from restaurants which is excellent. It is definitely ski-in ski-out, even in late March. When you ski out it's an easy piste down to the bottom of the Foret and Grand Vans lifts. To return you peel off the Tourmaline piste to the bottom of the Gerat chair, or get the Foret button and then ski down to the bottom of Gerat chair (easy). From there it's an easy green back to the apartment. Rosemary was excellent to deal with - very helpful and prompt at replying. She obviously takes pride in the apartment. We would have no hesitation in renting this apartment again. Thanks Rosemary! What a wonderful apartment and position for those looking for ski in and out. Only a 10 minute walk to the centre of town with shops, bars and restaurants although the restaurant at the apartments was superb as well. Outdoor pool was great. The apartment was lovely, clean and very well equipped. Communication with the owner Rosemary was excellent. I have no hesitation in recommending - we had a lovely time and should we return to Flaine, would most definitely stay here again. The apartment we rented from Rosemary was ideal for our family of 4.One double bedroom and a comfy sofa bed was perfect for us.Having the kitchenette was ideal as we ate in every night.Very convenient having a small supermarket next door to us for this purpose.Ski hire shop beside the supermarket was perfect.The fact that I could buy my ski passes here was a bonus as well.What made this apartment block special for us was the fact that we could walk out the door of the locker room on the 3rd floor,stick on our skis and set off on the short ski run to the lifts which then leads down to the main ski area of Flaine Forret and all the different lifts and pistes.A courtesy bus runs every 15 minutes leaving directly outside to take you to Flaine Forret if you didn't fancy the the ski in ski out idea. Ski conditions were very good and the green and blue runs were ideal for our family of novice skiiers. I also have to give a massive thank you to Rosemary for all the help she gave me in trying to answer all my questions leading up to our visit in Flaine.As I didn't book my trip through a travel company and did everything myself - the help Rosemary gave me in where to hire equipment,passes and lessons was invaluable to us.Also her determination to ensure our stay was enjoyable in her lovely apartment was very touching as well. Fantastic stay, cannot wait to return. One of the best ski holiday's we've had. Great apartment, clean & comfortable with all the amenities you could need. Location was great, bus stop outside the property, small supermarket at the neighbouring property with all essentials. Despite some poor reviews the ski rental shop at Helios were very helpful, efficient & friendly. Fantastic skiing in Flaine, great slopes, mountain restaurants, good lift system. Not a party resort but perfect for families. Staff were very friendly & helpful throughout our stay. Rosemary the property owner was very helpful! We will definitely be recommending this property to our family & friends. One of the best ski apartments we've stayed in. Comfy bed, quality interior, clean, everything you need included. The perks (pool, jacuzzi, ski in/out, free bus until midnight) were all a real treat. Info and advice from, and communication with Rosemary before, during and after stay was spot on. Plenty of skiing even in April spring snow! First class accommodation in a brilliant resort! Booked Terrasses D'eos in late summer, 2013. In the time between doing so and arriving, communication from Rosemary was excellent- couldn't have asked for more from a host. A quick google will show you that Flaine is one of the most snow-sure resorts in the French alps. However, I was slightly concerned at the snow cover leading up to our visit- there hadn't been any fresh powder for a good month or so! However, they are very good at managing the snow there and so as a result, this was not a big problem. Lots of quality powder and a good number of lifts operating. Now the resort itself- in my honest opinion, the best in Flaine. We arrived at around 10;00 on the 14th and after speaking to the receptionists (who speak very good English) we were able to pick up our key card early. Apartment 715 is located on the top floor and towards the back of the hotel. The room is exactly as pictured and very well equipped with everything you need for a kitchen, a television, DVD player and an array of films. The spa facilities are of course open to you, just as any other guest at the hotel. We enjoyed lazing in the hot tub after returning from the slopes, where you can enjoy the views of the landscape outside. There is a bus service which runs through Flaine foret- it is by far the easiest way to get to the slopes and shops from the hotel. It runs every 15 minutes and is free to use. On this note, I have seen reviews saying that the ski area is quite a trek from the hotel. It isn't, it is perfectly do-able. The only complaint I have is that the lift which links the Foret to the Forum broke down on the day we went to rent our ski's. This meant that I ended up carrying two sets of ski's and poles over my shoulders whilst my girlfriend carried two sets of boots up a somewhat icy/steep hill. Anyway, we can't thank Rosemary enough for this and we hope that you enjoy your stay as well as we did. 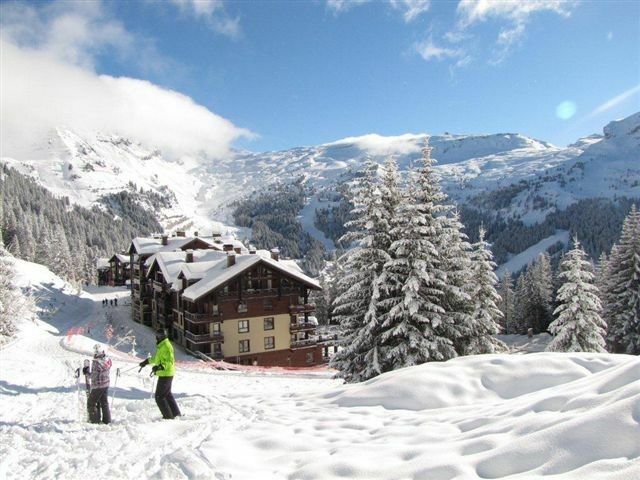 With stunning scenery, Flaine is set in a snow bowl which keeps the snow late into the season. With 133 ski runs in the Grand Massif (and 79 lifts) you can ski different slopes all week. Several ski schools/private instructors and kiddies' ski schools. summer. Flaine has easy accessibility from Geneva, and so many activities in addition to skiing! In winter you can also do Ice quadbiking, Paragliding, Snowkiting, Heli flights, Snowmobiling, ice driving, indoor climbing, dog sledding, snowshoeing, cross-country skiing or even just 10-pin bowling or going to the cinema. Easy transport by taxi or bus from Geneva airport (see details below), or 75 minute drive - A40 autoroute direction Chamonix, exit 19 and 30 minute drive to Flaine village. Our Mont Soleil building ('Les Terrasses d'Eos') is between Flaine "hameau" and Flaine Forêt. Nearest shop, creche, restaurant and ski rental 2 minutes walk. Free bus to other areas of Flaine in evenings (or walk). Easy access to all winter activities, plus golf and tennis in summer.